I am pleased to let everyone know that I am going to be doing a short talk at That Conference on August 9th. I am the last session, 2:30 pm, on the last day of the conference, which runs from August 7-9. The title of my talk is “Password Security, you might be doing it wrong” and you can read the full description of the talk on the session page. I am very honored and a little humbled to be included among the many great speakers that will be at That Conference. One of the nice perks is that I will also get to attend many great sessions at the event before I have to speak. I am doing a test run of my session with my co-workers next month, after that I will plan on posting a little more information about the talk. Right before I hit “publish”, I remembered a similar post that I did from 2008: Messy Divorce: Internet Style. I guess I should do a post like this every decade or so to remind people to secure their domain names. Several years ago, I help create and co-host a podcast called The Thirsty Developer with my good friend and fellow Microsoft Evangelist, Dave Bost. Creating, producing and editing the show was one of the most enjoyable experiences I have had around work. I hesitate to call it work, because we did it mainly after hours and had so much fun doing it. I left the show when I changed roles at Microsoft and a couple of other folks had co-hosting duties after me: Clark Sell and Adam Hoffman. Of course you never really “leave” something that you helped create, you only stop doing it as often. As some of you may know, Dave passed away a couple of years ago. I don’t speak much of it on social media, but I miss him terribly even to this day. I worked with Dave’s wife to transfer the domain name over to me. In doing so we had some issues with the content. The site was “off the net” for a few months. I did manage to find a copy of the site that dated back to when I was still running things. I have the RSS feed for the majority of the show notes (I think I have ~90 of the 104 total episodes). However, I only have 69 of the audio files. I am hoping that I can find more of the audio files and locate the rest of the show notes as well. If anyone stumbles across any of the old shows, please let me know. I hope that keeping the old episodes out there will allow the many great guests developers and other friends of the show a chance to go back and listen to their favorite episodes. Note: I stitched 2 screen shots together to create the seamless look in the screenshot above. My phone is not this long and skinny. In reality, the screen ends on about 2/3rds of the way down the photos hub and you can’t see the bottom apps without scrolling. Not a lot of apps, eh? Many of the things that you would use an app for are built into Windows Phone. It has great integration with my calendar, e-mail, tasks and contact databases. This is true both for Microsoft Services (like Exchange and outlook.com), but is also true for services by Google and Yahoo! as well. I would rather use the web than an app. Probably the number one thing I do on my phone is e-mail. Tied for second is either listening to podcasts or browsing the web (but a distant second). I would rather look at a website than download an app any day of the week. Nothing upsets me more than a company that wants me to download an app to do something mundane like get a map of their building or a list of their store hours. The mobile (responsive) web continues to get better and better and (I hope) we will soon be in a position that the mobile web will be a first class citizen and we won’t have to use apps except for the few things that require them (like shooting birds at rock and stones structures. My favorite thing about Windows Phone? Live Tiles – hands down. It is hard to show in a screen shot, but the Music+Videos app on the lower right of the start screen is animated with Neko Case’s picture and Name because her song was playing when I took the picture. Also the contacts that I have pinned to the start screen (my wife Jodie and my sons) will show their latest status from social media that I have wired up (Twitter and Facebook). I would be interested to see how other people customize their screen (not just Windows Phone – iOS and Android as well). It really should reflect your personality. PS: UFOs of Wisconsin – don’t ask. My buddy Michael Steineke @msteineke pinged me yesterday with a problem that he was having doing a clean install of Windows 8 Enterprise on his new ThinkPad Helix. He only got a few seconds into the explanation of the problem he was having when I told him the problem was his USB was not formatted as FAT32 and if he re-formatted the USB it would solve his problem. I know this because I had a similar experience last months when I was doing a clean install on my ThinkPad Carbon Touch. Mike and I both agreed that we should document the problem and solution in case someone else runs into it. In order to enable secure boot on a Windows 8 Machine, you must have UEFI and Secure Boot enabled when you install and if you use USB Media to install, it must be formatted as FAT32. Many USB drives are formatted as NTFS and many utilities that create bootable media for install will format the drives as NTFS (like the Windows 7 USB Utility). Windows 8 can install from this media (if you disable secure boot), but that is a feature you want. Instructions on how to create a FAT32 bootable drive are included at the bottom of this post. UEFI Secure Boot is a great thing…. Unified Extensible Firmware Interface (UEFI) is the modern firmware for operating systems to control the underlying hardware. You can think of it as the new version of the BIOS. UEFI is not a Windows-only technology, but a standard that is used by most operating systems. One of the new benefits is the ability to have a digitally signed and verified boot path (or secure boot). This all but eliminates attack vectors that load early in the boot processes (think root kits). With secure boot, you know that the entire code path has been digitally signed and that it has not been changed or tampered with. Be very careful when using the following commands, as selecting the wrong device could lead to data loss or other heart break. When in doubt, ask someone to double check your assumptions. Now you can copy the contents of the Windows 8 ISO onto the drive via Explorer, XCOPY or your favorite utility that copies files. Be sure to enable secure boot and boot from the USB drive to install. Hey thanks for reaching out to me. I am sure that your client is an awesome place to work. You might want to take a more careful look at my resume, because you will find that I am not qualified in any way shape or form to use the technology that your customer is seeking. My response is a little snarky and I should be nicer. I have only gotten a couple of responses from this: One asking me for my resume and one admitting that they pulled the information from LinkedIn. Evidentially if you pay for the LinkedIn premium membership, you get a lot more tools to search for people. Unlike some people, I am totally cool with the LinkedIn model. They provide me a free service and as a result they collect revenue from the few people who want extra utility from the service. As long as I can have a gateway between myself and the recruiter I am fine with that model. The gateway being they have to contact me via LinkedIn. I keep my information on LinkedIn reasonably current, much more so than that 10+ year old resume. So what I have been wondering is if it is possible to do away with the resume all together? I am not in the job market, but if I was would a recruiter or human resources department accept a hyperlink to a LinkedIn profile rather than a Word Document or PDF that contains the same information? I would think that since LinkedIn has a consistent data structure, they would actually prefer that. In the meantime, I hope I don’t have to update my resume any time soon…. I have been thinking about job titles lately. It started when someone asked me if I knew anyone who would be a good fit for a job posting for a SharePoint Architect. I proceeded to go on a rant about how no good architect would ever want to take a job that pigeon holed them into a single technology. I don’t think I ever answered the question and probably frustrated the person who asked me. About a week later, someone asked me what my ideal job title would be. I admitted that I had not put a lot of thought into the question, however a job title that I always thought was cool was “Director of Disruptive Technologies”. The title was held by Max Mancini at eBay. I had read about him and his job in the book Web 2.0 Heroes by Brad Jones (Disclaimer: Brad is a friend of mine, but I am not writing this to “pimp” his book). What I liked about it was that it described very well what he was doing: working with disruptive technologies. However it did not specify what the disruptive technologies were. If you have worked in technology long enough, you know there will always be disruptive technologies. So what goes into a “good” job title? I think there are a few attributes that make a job title “good”: Descriptive, Universal and Flexible. Descriptive means that people can read the title and have a (general) idea about what you do. We know that developer in a job title means that person writes code, as an example. Universal means that you are using terms that apply to most organizations. I like to use the “rank” as an example: A manager is someone who has people reporting to them, a President is higher than a Vice President. Flexible means that your job title can adapt over time. The flexibility is the part that I really like to focus on when I evaluate a job title. A job title of Cisco Pix Engineer, while descriptive and somewhat universal is not really that flexible. A more flexible title might be Firewall Engineer or even better Network Security Engineer. Kill all the job titles? I am getting ready to order new business cards with the new logo. I will update you on whether or not I have the guys to order it with this title, or if I do the predictable thing and use my official title. One of my early mentors advised me to never get hung up on job titles or rank. He said that in the military, when it “hits the fan” nobody turns to the highest ranking officer, they always turn to the guy that can get them out of the situation (usually a grizzled old Sargent). He also said the most important thing on your business card is not your job title, it is how the person should get a hold of you (e-mail, phone number, twitter handle, etc.). A required CD/DVD drive device driver is missing. If you have a driver floppy disk, CD, DVD, or USB flash drive, please insert it now. Note: If the Windows installation media is in the CD/DVD drive, you can safely remove it for this step. One or more of the above might fix the error for you, but none of these fixed my problem and most of them did not apply even apply to my situation. What was causing the problem for me was I had the USB device plugged into the USB 3.0 port for the machine. I moved the USB flash drive to the USB 2.0 port (on the other side of the laptop) and the install worked just fine. My speculation is that the boot loader for the installer worked fine, but the installer itself had issues with the USB 3.0 device. Windows 7 itself has no issues with the USB 3.0 port; it seems to be limited to the installer environment. I am also fairly certain that you would see the same problem on other machines with a USB 3.0 drive- so more than just the Samsung Series Nine. Note: This post seems a little off topic for this site; I usually don’t talk about troubleshooting issues and the like. However I wanted to post this in the hopes that if someone else runs into this issue, they might find this solution mixed in with all the older forum posts. Hope this helps…. I recently updated my “home page” or “splash screen”: http://larryclarkin.com/. Among some other changes that I made was the inclusion of a photo of myself; I was on the “fence” about doing this, because I have never been crazy about photos of myself. However I bit the bullet and included one taken about 3 years ago by John December at a Web414 meeting. It is shown here in a screen shot and the original is on Flickr. One of the questions / concerns that I had in using the photo was to make sure that I followed the license of the work, in this case it was a creative commons license: attribution, non commercial, share and share alike. I liked the idea of creative commons from the first moment that I heard about it during a conversation with myself, Rocky Lhotka and Matt Bumgardner on how design patterns out to be shared. All of the blog entries, photos and podcasts that I have created carry some version of the creative commons license. In addition to creating works with the license, I use works that others have shared as well (see many of the photos on this site). I wanted to make that clear, because my dilemma / critique has nothing to do with the license itself. When I decided to include John’s photo on my site I checked to see if he had any particular instructions for how he wanted the photo attributed to him. I could not really find any (I checked on his Flickr profile and at his website). John is not unique in providing instructions for how he wanted the photo attributed to him; it is usually the exception to find instructions on how people want to be attributed. When I have run across specific instructions they are almost always reasonable examples include: it is usually people preferring their name to be used (instead of a Flickr handle) or having the link go to their blog or home page. If you distribute, publicly display, publicly perform, or publicly digitally perform the Work or any Derivative Works or Collective Works, You must keep intact all copyright notices for the Work and give the Original Author credit reasonable to the medium or means You are utilizing by conveying the name (or pseudonym if applicable) of the Original Author if supplied; the title of the Work if supplied; to the extent reasonably practicable, the Uniform Resource Identifier, if any, that Licensor specifies to be associated with the Work, unless such URI does not refer to the copyright notice or licensing information for the Work. I found myself scratching my head and breaking out my “I am not a lawyer card” on that one! Barring any specific instructions I clearly spelled out “Photo by John December” and linked the name to his website. Another option would have been to link to the photo page on Flickr or to John’s Flickr Profile. Placing photos on a web page is probably the easiest use case for attribution. You have hyperlinks and great CSS styling to help you out. Other media, such as printed photos, sound recordings and video aren’t as robust in their ability to attribute. I talked with John at Photocamp Milwaukee 2 and verbally asked him if the attribution was okay; he agreed that it was. Thanks again for sharing some of your photos under the creative commons license. I just realized that nowhere have I spelled out my preferred attribution. 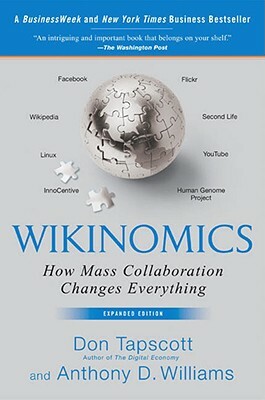 For week 2 of my Book-a-week resolution I read Wikinomics: How Mass Collaboration Changes Everything by Don Tapscott and Anthony Williams. Instead of doing a full book review on it, I thought I would talk a little about the cover. Here are the book covers from the two editions that are currently in print. The first edition is on the left and was published in December, 2006. The second edition (the one that I read) is on the right hand side and was published in September, 2010. Might be a little hard to notice the difference with these small thumb nails, but it is a little more obvious on the book when you hold it life size. I am not talking about the colors, the quotes or the “Expanded edition” added to the cover. I am talking about how they replaced MySpace on the original edition with Facebook on the second edition. The authors point out in the forward that the book seemed “So 2006….” when they created the next edition and having MySpace listed on the cover is not the only thing that dates the book in that era. And I don’t begrudge them dropping MySpace from the cover; would you buy a book in 2010 / 2011 that talked about how awesome MySpace is? My only complaint is that they replaced MySpace with Facebook when Facebook only plays a minor role in the book. All the references to Facebook are in the last chapter of the book (called Enterprise 2.0) and it does not feel really integrated into the book core tenants. I do have to wonder what the cover of the 3rd edition of this book (circa 2014) will include on the cover. Surely Wikipedia and Linux will be on the cover, but will Facebook and Flickr be? Note: If you are following along just to see if I have failed miserably in my book-a-week resolution, I am doing okay. I am technically a couple weeks behind, but I have 2 books that I am almost done reading. I am reading a lot more than I am blogging about, so I have put up a list of completed books so you can see the progress.